Our dosing and control equipment is cost-effective, reliable, easy-to-use and maintain. We provide full operating instructions and training and implement a proactive maintenance programme to ensure it continues to operate effectively. 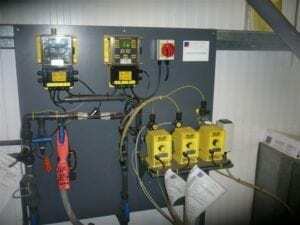 We can supply, install, commission and service, any type of water treatment dosing and control equipment. 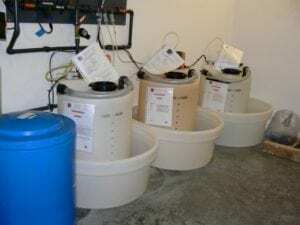 We are able to supply single dosing pumps up to bespoke engineered fully automatic water treatment chemical dosing systems, to automatically dose and control liquid water treatment chemicals or solid water treatment chemicals. Chemical dosing pumps and controllers (all sizes and types)-we have a full range of chemical dosing pumps and metering equipment to suit any industrial or commercial situation. Steam boiler or steam generator feedwater or boiler water system control equipment-we supply a full range of steam boiler water treatment controllers for monitoring and control of TDS, water treatment chemical dosing and waterside monitoring functions, back board mounted, with bespoke built to order manifolds as required. We can then service and maintain it using our team of experienced engineers. To discuss dosing and control equipment in more detail, call us on 0870 460 2980.